In less than two weeks, SpongeBob SquarePants comes out of his pineapple under the sea to journey into our world in The Spongebob Movie: Sponge Out of Water, which arrives 11 years after the hit animated show's first big screen adventure, The SpongeBob SquarePants Movie. Paramount Pictures has released 32 images from this live-action/CGI animation hybrid, which shows some of your favorite creatures in action, such as SpongeBob, Patrick Star, Mr. Krabs, Squidward Tentacles, Sandy Cheeks and Plankton, along with a new live-action character. The plot follows SpongeBob and his friends as they finally surface on Earth, going on a journey to discover a stolen recipe, which puts them square in the path of a nefarious pirate known as Burger-Beard (Antonio Banderas). 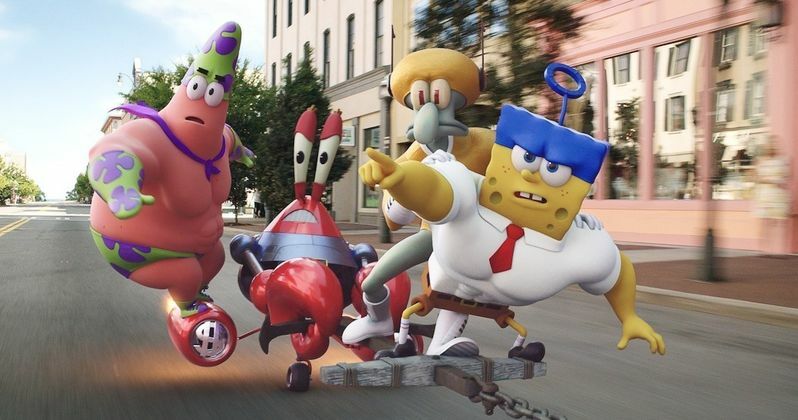 Clancy Brown (Mr. Krabs), Bill Fagerbakke (Mr. Star), Rodger Bumpass (Squidward Tentacles), Carolyn Lawrence (Sandy Cheeks) and Mr. Lawrence (Plankton) reprise their roles from the hit animated TV series, created by Stephen Hillenburg. Take a look at the new photos from The Spongebob Movie: Sponge Out of Water, which was directed by Paul Tibbitt, before this live action/CGI-animation hybrid hits theaters on February 6. If that wasn't enough, we also have a new music video for N.E.R.D. and Pharrell Williams' song "Squeeze Me" from the movie's soundtrack.